Ah yes, another one of my infamous Christmas gift books. seem to have amazing covers. Matched was waited with bated breath (haha, that rhymed! Oh, I am so distractable today...) by what feels like millions of people. When you hear good reviews or a general good vibe it's very hard to distinguish between the individual voices and what they actually might be saying. Like one of my reviews, for example, which always strive to give both positive and negative aspects of books, unless the thrill of reading them was overwhelmingly amazing and the faults will only be mentioned briefly. However, that is my personal choice, and I believe I've only ever given one near-perfect review (for Revolution by Jennifer Donnelly) and only because it's my favourite book ever. Cassia has always trusted the Society to make the right choices for her: what to read, what to watch, what to believe. So when Xander's face appears on-screen at her Matching ceremony, Cassia knows with complete certainty that he is her ideal mate... until she sees Ky Markham's face flash for an instant before the screen fades to black. The Society tells her it's a glitch, a rare malfunction, and that she should focus on the happy life she's destined to lead with Xander. But Cassia can't stop thinking about Ky, and as they slowly fall in love, Cassia begins to doubt the Society's infallibility and is faced with an impossible choice: between Xander and Ky, between the only life she's known and a path that no one else has dared to follow. First, let's talk about the setting. 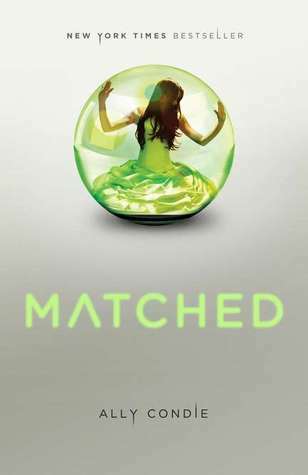 Matched is, as you've probably heard, a dystopian novel. However, the beginning of the book makes it sound much more like a utopia, and I loved this. You kind of know everything's going to fall apart, but the whole facade is so perfect for a while that you begin to become comfortable with it, and think, "Hey, this is okay! People are happy, they're fulfilled, Cassia's going to stay with her best friend turned sudden boyfriend forever and everything's going to be hunky dory!" but then, the cracks start to appear, in a very skilful way. I don't know how Ally Condie managed to make a perfect society where nothing ever happens so intriguing, but she does. From the beginning she pulls you into this world and keeps you interested. The Officals who represent the Society are horribly realistic and believable, even when Cassia is being warned very heavy for her insubordination to the society's propaganda. Ally Condie ties a clean writing style into this sterile dystopia which builds on the naivete of its citizens. It's like the cover; simple but effective, and at times, strikingly beautiful. That is, it's not simplistic in a poorly written sense, as simplicity can so often be mistaken, it's simplistic in a stylistic sense. Cassia is an innocent, brainwashed, usually happy person, but she is also a teenager finding her way through life in a cool, calm, and suddenly shaken environment, and Ally's writing captures this brilliantly. One of the main themes of the book was the love-triangle, or to be more specific, the subtle battle between the two heroes and the heroine. I like to think of it as Xader vs Ky; Conformity vs. Rebellion, Known vs. Unknown, Perfection vs. Imperfection, love that was dictated by Society vs. love that was dictated by oneself etc etc, but you get the gist. As character, they were both equally amazing. I loved Xnader from the very start! But Ky grew on me mas the novel progressed, especially his interest in forbidden poetry (!) but I think my heart still belongs to Xnader. Who knows, maybe I really am falling for the good boy this time... Another character I loved included Cassia's grandfather, but other than that I found many of the secondary characters to be too sketchy and vague. I couldn't see them in my mind, and it felt like they were purely instruments in the story, and instruments that didn't really progress the plot at that. This affected Cassia at times too, but I kept reading anyway. And speaking of the plot; okay, so this was one of my major irritations. For a long time, it didn't really seem like there was any plot at all. Much as I appreciate the subplots and the realism, I wanted kickass action and lots of shooting/fighting/gouging/kicking well, more kickass action! That's the problem with Matched; it never really breaks out of its box. It barely even scratches the glass. However, I doubt the depth I wanted and my other issues with plot and character will faze the intended audience. This isn't crossover fiction; it's pure YA. The book is and will remain popular in its genre. If you read YA commercial fiction, you don't want to miss this one - and hear this; it beats Divergent every time. In less than five words: dystopian, utopian, thought-provoking (and yes, that counts as one word! ), brilliantly written.